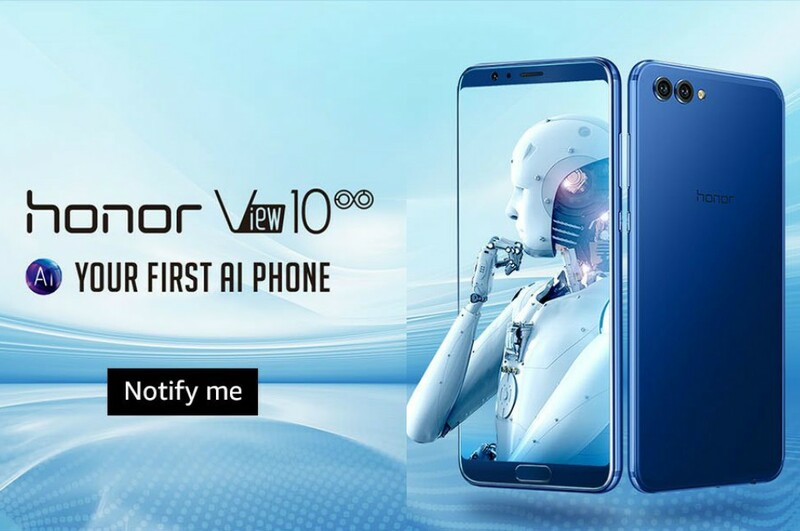 Huawei sub-brand Honor introduced the Honor View 10 flagship at an event in London earlier this month, and confirmed that the phone will launch in several countries including India in January. And now ahead of local launch, Honor has started taking registrations of the View 10 on Amazon India. Currently there is just 'Notify me' option on Amazon India. The sale is expected to start on January 8. The Honor View 10 comes with 5.9-inch Full HD+ full screen 18:9 display and is powered by octa-core Kirin 970 processor, which is aided by a dedicated NPU (neural processing unit) processor for enhanced A.I capabilities. The phone comes in three RAM/storage configurations: 4GB/64GB, 6GB/64GB and 6GB/128GB. However, it is not known which model will be available in India. The storage is expandable via microSD card. It ships with dual-rear camera, that consists of a 16MP RGB sensor and 20MP monochrome sensor, and the cameras work in tandem with neural processing unit to offer real-time scene and object recognition functionality as well as automatically choose the best camera settings for any environment or focal point for enhanced photography experience. The rear camera also boasts f/1.8 aperture, LED flash, PDAF, CAF, and 4K video recording capabilities. The front facing unit houses 13MP f/2.0 camera sensor and feature A.I selfie portraits and face unlock. The phone runs Android 8.0 based Emotion UI 8.0, and supports dual-SIMs (hybrid slot), 4G VoLTE, WiFi 802.11ac, Bluetooth 4.2, GPS, USB Type-C and NFC for connectivity. It is fueled by 3750mAh battery, and supports Super Charge fast charging technology that promises 0 to 50 percent charge in just 30 minutes. Color options are Midnight Black and Navy Blue. At the time of global announcement, Honor revealed that the phone will cost 499 Euros (Rs. 38,000) in Europe. So in India, the pricing can be expected to be around Rs. 45,000. Apart from India the Honor View 10 will also release in the United States.